Well, shucks. I’m a day late posting a Cinco de Mayo recipe. But once you make this soup you won’t care what day it is, what time it is, or what year it is. You’ll just be focused on shoveling it into your mouth quickly enough. This recipe completely took me by surprise in the best possible way. I dumped the ingredients into the slow cooker Sunday morning and hoped for the best. I was absolutely thrilled when I lifted the lid, took a taste, and discovered it was bursting with flavor. A happy dance in the kitchen ensued. 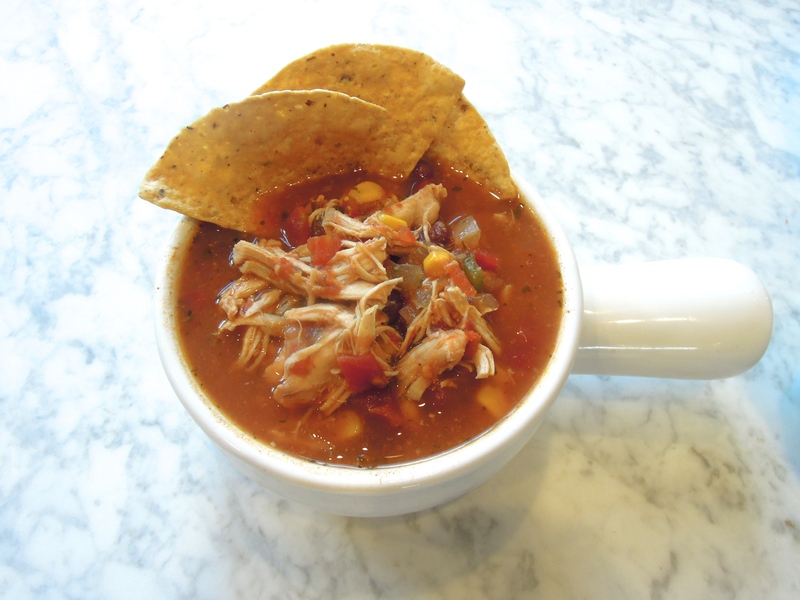 It’s among the best tortilla soups I’ve ever had! My love for tortilla soup is well established. I order it everywhere. I even have a vegetarian tortilla soup recipe here. And oh man do I still love that recipe. But THIS. This one is a keeper, too. 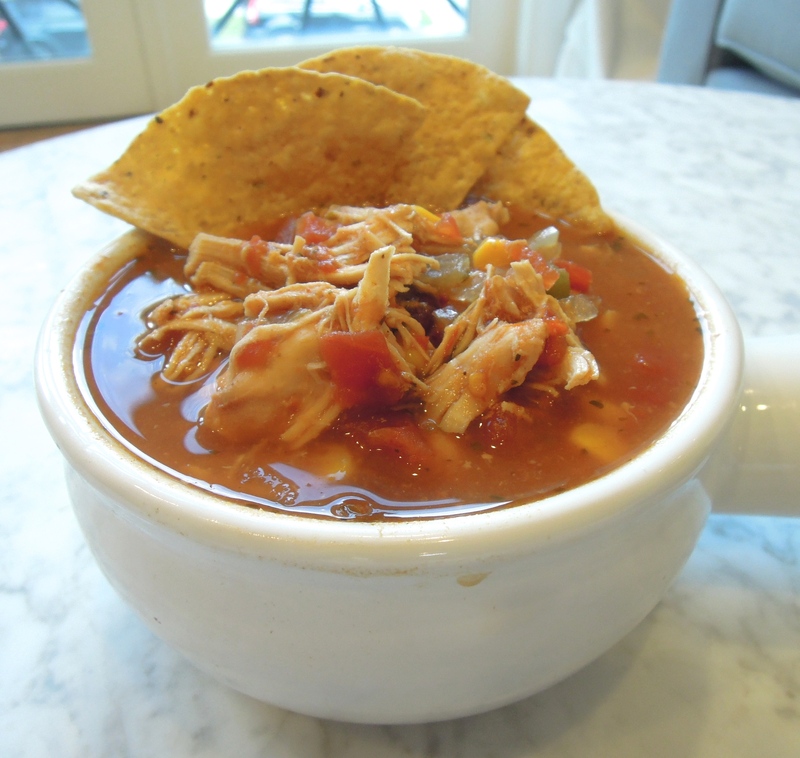 Sometimes you just want some chicken in your tortilla soup and you want to use the convenience of a slow cooker. Feel free to top your soup with whatever you like–cilantro, chunks of avocado, fresh lime juice, or some cheese all work great. I kept it suuuuper simple and just crumbled some tortilla chips on top. It’s so easy and tasty. I’m already planning to continue the fiesta and put it on our menu for next week. I think you should, too! Place the chicken breasts through the bay leaf in the slow cooker. Combine onion, garlic, jalapeño, and olive oil in a microwave-safe glass bowl. Microwave in 1 to 2 minute increments, stirring after each one until onion is softened, about 4 to 5 minutes total. Add to slow cooker. Cover the slow cooker and cook on low 6 to 8 hours. When it’s done cooking, remove chicken breasts to a cutting board and shred with two forks. Return chicken to slow cooker. Stir, taste, and adjust seasonings as needed. Serve in bowls with toppings of your choice such as cilantro, diced avocado, cheese, sour cream, or lime juice. Serve with tortilla chips. This entry was posted in Chicken, Soup on May 6, 2014 by Paige Greenfield.